Home › › Tooth Damage and All About Enamel › Bruxing or Clenching Your Teeth? When it comes to the negative side-effects of sports and athletic activity, we usually think of sore muscles and overuse injuries. Hyperextensions, shin splints, tendonitis – they’re all fairly common. But the adverse effects on oral health are among the lesser known downsides to high impact activity. These exercises often lead to xerostomia and bruxing. Many athletic activities that encourage extensive, rapid mouth breathing, like marathon running, can invite bacteria buildup in the mouth. This eventually leads to xerostomia and tooth decay. Long-distance swimming in some improperly chlorinated pools can contribute to dental erosion. But one of the toughest activities on teeth is weightlifting. 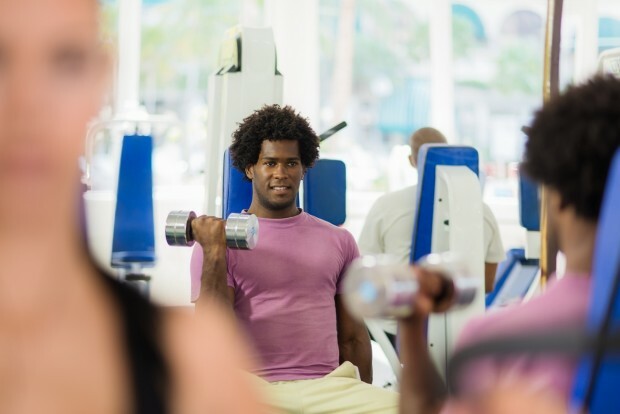 Jaw clenching often accompanies weightlifting. This is because of the masseter, a muscle along the jaw that opens and closes the mouth, functions together with muscles in the legs, arms, and back. When these muscles engage, the muscles in the face tighten, resulting in bruxism: the clenching, bracing or grinding of the teeth. Competitive powerlifting like squatting and deadlifting cause an increase in facial muscle activity, causing bruxing. Bruxing during squats and dead­lifts, which can help improve stability, may help an athlete lift heavier weights. However, this activity puts serious weightlifters at high risk of long-term dental damage. What Kind of Dental Damage? Pain in the ear and in the face. Reduced range of motion of the temporomandibular joint (commonly referred to as TMJ). Grating and friction in the jaw during chewing or other mandibular action. These symptoms can cause or worsen neck aches, headaches, earaches and other facial pain. Severe bruxing can also damage dental restorations like crowns and resin-based restorations. For that reason, metal/ceramic or full metal restorations should be chosen for patients who are chronic bruxers, in order to mitigate the effects of bruxing on the teeth themselves. How Can I Prevent Bruxing? Certain practices can help prevent bruxing: exhaling during completion of the lifting movement can prevent excessive clenching. You may not be aware that anything like that is happening to you. The best is to ask your doctor if there are early signs that he or she may be able to identify to help you to protect your teeth and prevent further damage with custom guidance. Awareness is very important. While this can protect your teeth and mouth from damage, it may also decrease the power of your lift. There are other ways to minimize the negative effects of bruxing, too. Mouth guards, for example, can be worn to minimize impact and grinding. These types of interventions can prevent long-term damage, so you can keep building muscle mass without worrying about losing your teeth.